Driving, in itself, is a task that many of us take for granted. We’re used to simply jumping in our vehicles, turning the key, and going to wherever it is we’re heading to. Oftentimes, the places we frequently travel to are on very familiar roads. Dangers exist everywhere and, as responsible drivers, we need to be aware of changing road hazards that come with the changing of seasons. With daylight savings time changes, this means we’re instantly thrust into drive times that have changed by one hour. During your morning and evening commute, use your vehicle’s visor to block the sun’s rays. Clean the inside of your windshield frequently. You’d be amazed at how much better you’ll see – even during the day – when you have a clean windshield. Air pollutants like cigarette smoke can cling to the glass, decreasing your visibility. Do not use high-gloss dashboard protectants. The reflection of light off your dashboard will create an added distration. Fallen, wet leaves are more dangerous than we think. Overnight, leaves fall and become wet with morning dew. Making turns, stopping and accelerating are much more dangerous during commute times when wet leaves are scattered all over the road. 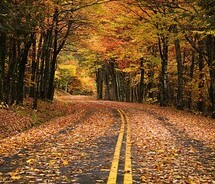 Leaves will cover potholes and other hazards. Piles of leaves are also a fun place for kids to play – in the middle of the backyard. Oh deer! Wildlife activity increases during Fall. October, November and December are some of the busiest months for deer wrecks. Deer are most active at dawn and dusk – looking for food. As we get closer to Winter, we’ll post more tips and reminders of driving during really chilly temperatures. Your vehicle, and your insurance company, will thank you! Contact us at Creech Import Repair if you have any questions, tips, or newsworthy information you’d like us to share.